The return of Andrew Luck was a joyous occasion for Indianapolis Colts fans. But as the preseason has gone on, that joy has been slowly replaced with dread. What if he gets hit on his surgically repaired shoulder and it gets messed up again? Can he take it? Saturday night, against the San Francisco 49ers, fans found out. The hit came courtesy of 49ers linebacker Dekoda Watson on the tail end of a 15-yard scramble. But not only did he get up and appear to be just fine. He threw a nice, crisp pass on the next play. 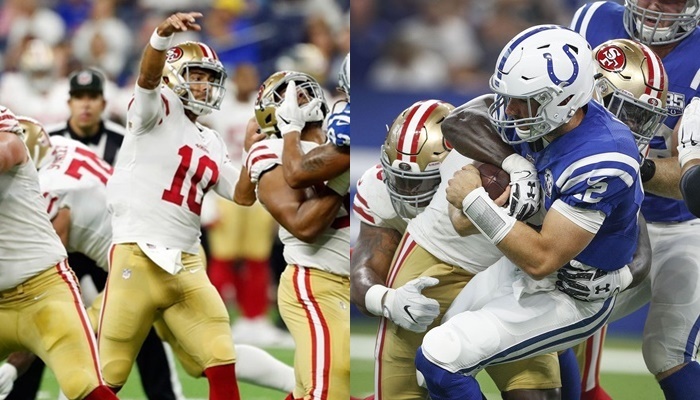 Not only did Andrew Luck (8-10 for 90 yards and a touchdown) and his shoulder survive getting whacked, but he led the first team offense to its first touchdown of the preseason! The score, a 15-yard pass to Eric Ebron, came on the tail end of a 10-play, 75-yard drive. A change of scenery could be just what Eric Ebron He still doesn’t look like the beast he was in college. But Luck will be more than happy to have a big target like him—especially if he catches every pass thrown his way as he did against the 49ers (five receptions for 54 yards and a touchdown). The Colts need a running game—bad. You could blame their inability to run the ball against the 49ers on poor blocking (of which there was plenty). But at some point, a running back has to be able to make something happen on his own. No one did Saturday night (35 combined carries for 80 yards and a touchdown). Luck was the most productive ball carrier (four carries for 27 yards); Jordan Wilkins was the most productive running back (14 carries for 28 yards). Richard Sherman made his first appearance in a 49ers uniform and deflected the only pass thrown his way. Jimmy Garoppolo (9-19 for 135 yards) was able to get the 49ers offense moving, but he couldn’t get the ball into the end zone (no touchdowns on three drives into the red zone). They were 11-24 in the red zone last season one Garoppolo became the starter, so this is nothing new. Injuries led the team to sign Alfred Morris. But with how he played (17 carries for 84 yards), they may want to figure out how to keep him around once everyone gets healthy. For those that keep score in the preseason, the Colts won 23-17. The 49ers will close out their preseason next week when the Los Angeles Chargers come to town. Indianapolis will wrap up its preseason with a visit to Cincinnati to play the Bengals.